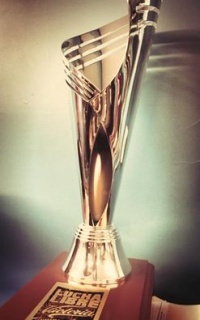 Trophy awarded to winner team of tournament. The Lucha World Cup, officially known as Lucha Libre Victoria World Cup for sponsorship reasons, is an annual professional wrestling trios tournament produced by Lucha Libre AAA World Wide (AAA) since 2015. It's featured by wrestlers from promotions by all around the world. The format of Lucha World Cup, for the first two years, is a single-elimination tournament structured by quarterfinals, semifinals, third place match and the final. Matches have a 15-minute time limit. If a match finished without a winner, teams enters in a sudden death in order to get a winner. Every team must select one of their members, and the two picked wrestlers must face off in a 5-minute match looking for get the win for it's team. There will be as many sudden deaths as necessary to determine a winner. The format was changed for the 2017 edition. Teams were two people each, the time limit was reduced to 10 minutes and the overtime period was reduced to three minutes. No third place match was held. This page was last edited on 12 October 2017, at 13:37.